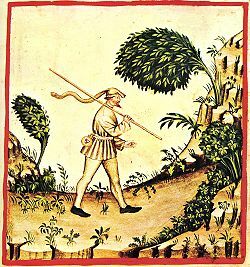 Wind, tacuinum sanitatis casanatensis (fourteenth century). In common terminology, wind is the flow of air. In a broader sense, it is the flow of gases that compose an atmosphere. The latter definition takes into account the presence of atmospheric gases on various planetary bodies, in addition to the Earth. There are various types of winds, which may be classified in any of several ways, such as by their spatial scale, speed, geographic location, the types of forces producing them, or their effects. Some winds are gentle breezes. Others, known as eolian (or aeolian or æolian) winds, reshape landforms by processes such as large-scale erosion and dune formation. Early mariners relied on the "trade winds" (or "trades") to carry them across oceans. Others harnessed the power of the wind to drive windmills used for grinding grain and pumping water. Today, wind turbines are being built in some parts of the world to generate electricity. In ancient Greek mythology, the four winds were personified as gods, called the Anemoi. They were named Boreas, Notos, Euros, and Zephyros. The ancient Greeks also observed the seasonal change of the winds, as evidenced by the Tower of the Winds in Athens. The term æolian is derived from the name of the Greek god Æolus, the keeper of the winds. Forces that drive the wind or affect its patterns include the pressure gradient force, the Coriolis force (based on the planet's rotation), buoyancy, and friction. When a difference in pressure exists between two adjacent air masses, the air tends to flow from the region of high pressure to the region of low pressure. On a rotating planet, flows will be acted upon by the Coriolis force, in regions sufficiently far from the equator and sufficiently high above the surface. In addition, a major factor that drives large-scale global winds is the differential heating between the equator and the poles; that is, the difference in absorption of solar energy between these climate zones. As noted above, there are various types of winds. Some are known as global winds, such as the wind belts that exist between the atmospheric circulation cells. Other winds, such as sea breezes, are a consequence of geographic features. In addition, there are upper-level winds, which typically include narrow belts of concentrated flow called jet streams. Synoptic-scale winds result from pressure differences in surface air masses in the mid-latitudes. Mesoscale winds are those that act on a local level, such as gust fronts. On the smallest scale are microscale winds, which blow on a scale of only tens to hundreds of meters and are essentially unpredictable, such as dust devils and microbursts. Prevailing winds are those that are a consequence of global circulation patterns. They include the trade winds, the westerlies, the polar easterlies, and the jet streams. Because of differential heating and the fact that warm air rises and cool air falls, there arise circulations that (on a non-rotating planet) would lead to an equator-to-pole flow in the upper atmosphere and a pole-to-equator flow at lower levels. Because of the Earth's rotation, this simple situation is vastly modified in the real atmosphere. In almost all circumstances, the horizontal component of the wind is much larger than the vertical — the exception being violent convection. Early mariners relied on these winds to propel their ships from Europe to North and South America. Their name derives from the Middle High German trade, akin to Old English trod meaning "path" or "track," and thus the phrase "the trade wind blows," that is to say, on track. The Trades form under the Hadley circulation cell, and are part of the return flow for this cell. The Hadley carries air aloft at the equator and transports it poleward north and south. At about 30°N/S latitude, the air cools and descends. It then begins its journey back to the equator, but with a noticeably westward shift as a result of the Coriolis force. The Westerlies, which can be found at the mid-latitudes beneath the Ferrel circulation cell, likewise arise from the tendency of winds to move in a curved path on a rotating planet. Together with the airflow in the Ferrel cell, poleward at ground level and tending to equatorward aloft (though not clearly defined, particularly in the winter), this predisposes the formation of eddy currents which maintain a more-or-less continuous flow of westerly air. The upper-level polar jet stream assists by providing a path of least resistance under which low pressure areas may travel. The Edmonton, Alberta, Canada tornado of 1987 is evidence that powerful tornadoes can develop at high latitudes. Records of tornadoes in northern latitudes are spotty and incomplete because of the vast amount of uninhabited terrain and lack of monitoring, and it is certain that tornadoes have gone unseen and unreported. The deadly Edmonton tornado of 1987, which ranked as an F4 on the Fujita scale and killed 27 people, is evidence that powerful tornadoes can occur north of the fiftieth parallel. The jet streams are rapidly moving upper-level currents. Traveling generally eastward in the tropopause, the polar jets reside at the juncture of the Ferrel cell and the Polar cell and mark the location of the polar cold front. During winter, a second jet stream forms at about the thirtieth parallel, at the interface of the Hadley and Ferrel cells, as a result of the contrast in temperature between tropical air and continental polar air. The jet streams are not continuous, and fade in and out along their paths as they speed up and slow down. Though they move generally eastward, they may range significantly north and south. The polar jet stream also marks the presence of Rossby waves, long-scale (4000 - 6000 km in wavelength) harmonic waves which perpetuate around the globe. Synoptic winds are winds associated with large-scale events such as warm and cold fronts. They are part of what makes up everyday weather. They include the geostrophic wind, the gradient wind, and the cyclostrophic wind. 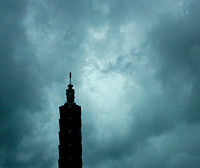 Taipei 101 endures a typhoon in Taiwan. As a result of the Coriolis force, winds in the northern hemisphere always flow clockwise (when seen from above) around a high pressure area and counterclockwise around a low pressure area. (The reverse occurs in the southern hemisphere.) At the same time, winds always flow from areas of high pressure to areas of low pressure. The path traveled by air, resulting from the combination of the pressure gradient force and the Coriolis force, is close to being parallel to isobars. The wind following this path is known as geostrophic wind. Winds are said to be truly geostrophic only when other forces (such as friction) acting on the air are negligible, a situation that is often a good approximation to the large-scale flow away from the tropics. In certain circumstances, the Coriolis force acting on moving air may be almost or entirely overwhelmed by the centripetal force. Such a wind is said to be cyclostrophic, and is characterized by rapid rotation over a relatively small area. Hurricanes, tornadoes, and typhoons are examples of this type of wind. Synoptic winds occupy the higher boundary of what is considered "forecastable" wind. Winds at the next lowest level of magnitude typically arise and fade over time periods too short and over geographic regions too narrow to predict with any long-range accuracy. These mesoscale winds include such phenomena as the cold wind outflow from thunderstorms. This wind frequently advances ahead of more intense thunderstorms and may be sufficiently energetic to generate local weather of its own. Many of the "special" winds, addressed in the last section of this article, are mesoscale winds. Microscale winds take place over very short durations of time—seconds to minutes—and spatially over only tens to hundreds of meters. The turbulence following the passage of an active front is composed of microscale winds, and it is microscale wind which produces convective events such as dust devils. Though small in scope, microscale winds can play a major role in human affairs. It was the crash of a fully-loaded Lockheed L-1011 at Dallas-Fort Worth International Airport in the summer of 1985, and the subsequent loss of 133 lives, that introduced the term "microburst" to many people, and that was a factor in the installation of Doppler radar in airports and weather installations worldwide. Some local winds blow only under certain circumstances, that is, they require certain temperature distributions. Differential heating is the motive force behind land breezes and sea breezes (or, in the case of larger lakes, lake breezes), also known as on-shore or off-shore winds. Land absorbs and radiates heat faster than water, but water releases heat over a longer period of time. The result is that, in locations where sea and land meet, heat absorbed over the day will be radiated more quickly by the land at night, cooling the air. Over the sea, heat is still being released into the air at night, which rises. This convective motion draws the cool land air in to replace the rising air, resulting in a land breeze in the late night and early morning. During the day, the roles are reversed. Warm air over the land rises, pulling cool air in from the sea to replace it, giving a sea breeze during the afternoon and evening. Mountain breezes and valley breezes are due to a combination of differential heating and geometry. When the sun rises, it is the tops of the mountain peaks which receive first light, and as the day progresses, the mountain slopes take on a greater heat load than the valleys. This results in a temperature inequity between the two, and as warm air rises off the slopes, cool air moves up out of the valleys to replace it. This upslope wind is called a valley breeze. The opposite effect takes place in the afternoon, as the valley radiates heat. The peaks, long since cooled, transport air into the valley in a process that is partly gravitational and partly convective and is called a mountain breeze. Mountain breezes are one example of what is known more generally as a katabatic wind. These are winds driven by cold air flowing down a slope, and occur on the largest scale in Greenland and Antarctica. Most often, this term refers to winds which form when air which has cooled over a high, cold plateau is set in motion and descends under the influence of gravity. Winds of this type are common in regions of Mongolia and in glaciated locations. Because katabatic refers specifically to the vertical motion of the wind, this group also includes winds which form on the lee side of mountains, and heat as a consequence of compression. Such winds may undergo a temperature increase of 20 °C (36 °F) or more, and many of the world's "named" winds (see list below) belong to this group. Among the most well-known of these winds are the chinook of Western Canada and the American Northwest, the Swiss föhn, California's infamous Santa Ana wind, and the French Mistral. The opposite of a katabatic wind is an anabatic wind, or an upward-moving wind. The above-described valley breeze is an anabatic wind. A widely-used term, though one not formally recognised by meteorologists, is orographic wind. This refers to air which undergoes orographic lifting. Most often, this is in the context of winds such as the chinook or the föhn, which undergo lifting by mountain ranges before descending and warming on the lee side. Geostrophic wind: Wind that is a result of the balance between the Coriolis force and pressure gradient force. It flows parallel to isobars and approximates the flow above the atmospheric boundary layer in the mid-latitudes if frictional effects are low. Thermal wind: It is not actually a wind but a wind difference between two levels. It exists only in an atmosphere with horizontal temperature gradients (baroclinicity). Ageostrophic wind: It is the difference between actual and geostrophic wind; the wind component responsible for air "filling up" cyclones over time. Gradient wind: Similar to geostrophic wind, but including centrifugal force. Wind direction is reported by the direction from which it originates. For example, a northerly wind blows from the north to the south. Doppler LIDARs can measure the Doppler shift of light reflected off suspended aerosols or molecules. This measurement can be directly related to wind velocity. Radiometers and Radars can be used to measure the surface roughness of the ocean from space or airplanes. This measurement can be used to estimate wind velocity close to the sea surface over oceans. ↑ Jupiter's Hurricane-Force Winds Increase In Depths of the Planet's Atmosphere. NASA JPL. Retrieved October 11, 2007. ↑ These processes are known as eolian processes or eolian action. Tornadoes and hurricanes might at times be considered to produce such changes. Database of Wind Characteristics – Wind data for wind (turbine) design and wind resource assessment and siting. Meteorology Guides: Forces and Winds – Instructional module from the University of Illinois. Names of Winds – A list from Golden Gate Weather Services. Wind Atlases of the World – Lists of wind atlases and wind surveys from all over the world. Winds of Mars: Aeolian Activity and Landforms – Paper with slides that illustrate the wind activity on the planet Mars. This page was last modified on 4 August 2013, at 19:27.